Since the 1960s Audrey Rooney has led a long and active career in the arts. Presently she studies voice with NATS member Phyllis Jenness and belongs to “Be a Better Singer,” a program founded by Ms. Jenness. In 2013 Rooney, a Kentucky Bach Choir Board member, stepped forward as the primary sponsor of its vocal competition, ultimately establishing an endowment to ensure perpetuity of the competition, now held biennially. Since the 1960s Audrey Rooney has been active in the arts. An alto in the early seasons of the Lexington Singers, she continued her avocation in Pennsylvania and Delaware, where she studied voice, sang mezzo roles with Gilbert and Sullivan troupes, and performed with the Delaware Singers, a 16-voice professional choir. Returning to Lexington, she was an ensemble member and occasional soloist with the University of Kentucky Collegium Musicum. In 1987 she joined a summer workshop in Siena, Italy, performing Vivaldi's Gloria in the cathedral and arias in Tuscan hill towns. For the Maryland State Arts Council, Ms. Rooney served on yearly panels reviewing grants to non-profit chorales and opera companies; chaired the Marketing committee for Chesapeake Chamber Music and edited its newsletter, Interlude. She and husband James were among the initial donors to the Chesapeake Chamber Music Competition, now a global draw. On a smaller scale, she co-chaired Kent County Chamber Music, bringing artists from Baltimore, Philadelphia, and Wilmington to play in an idyllic country church and helped audition high school musicians for scholarships awarded by the Queen Anne’s County Arts Council. Presently she studies voice with NATS member Phyllis Jenness and belongs to “Be a Better Singer,” a program founded by Ms. Jenness. 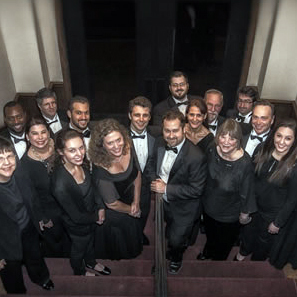 In 2011, the Kentucky Bach Choir initiated a vocal competition for undergraduate and graduate students to encourage study of the solo vocal repertoire of J. S. Bach. For the competition, students submit recordings of themselves singing two arias by Bach and, for the sake of contrast, their choice of an aria by Haydn or Mozart. Following pre-screening, finalists come to a live competition in Lexington, Kentucky, to sing before an audience and a panel of judges. The winner receives a $1,500 grand prize and an opportunity to perform as a featured paid soloist in a subsequent Kentucky Bach Choir season. Additionally, up to two singers may be chosen by the judges to receive encouragement awards of $500 each. The first two years of the competition were funded primarily from a local arts grant and from the choir’s operating budget. Sensing the tenuous nature of such funding, in 2013 Rooney, by then a Kentucky Bach Choir Board member stepped forward as the primary sponsor of the competition, ultimately establishing an endowment to ensure perpetuity of the competition, now held biennially. The competition is adjudicated by three judges: a voice instructor, a keyboardist with early music experience, and the Artistic Director of the Kentucky Bach Choir, Marlon Hurst. Since 2011, NATS member Kristine Hurst-Wajszczuk, Associate Professor of Voice and Director of Opera at the University of Alabama-Birmingham, has served as the voice instructor adjudicator. In her work with NATS, Dr. Hurst-Wajszczuk, Vice President for Workshops, coordinates national workshops each year, serves on the national board, and is Online Index Editor for the Journal of Singing. The 2018 competition will be held at First Presbyterian Church in Lexington, Kentucky on Saturday, April 14 at 2 p.m. Applications must be postmarked by March 2 or received online by March 5. For complete information, visit http://kentuckybachchoir.org. Erica Intilangelo, soprano, who in 2016 completed her Master’s Degree in Vocal Performance at the College-Conservatory of Music at the University of Cincinnati. She now lives in Connecticut and commutes to New York for auditions. Her recent roles include La Fée in Massenet's Cendrillon, Ilia in Mozart's Idomeneo, and Carolina in Cimarosa's Il matrimonio segreto (Cincinnati Chamber Opera). In 2017 she attended the Crested Butte Music Festival and sang the roles of Alexis in Offenbach's L'île de Tulipatan and Nella in Puccini's Gianni Schicchi. She will be an Apprentice Artist at Sarasota Opera in Florida from January through the end of March 2018. Eric Jurenas, counter-tenor, also a graduate of CCM, has just completed a season in Europe with performances at the Komische Oper Berlin, Wiener Staatsoper, Royal Opera House - Covent Garden, and Theater an der Wien. This season he will appear in New York City on Broadway as the 'Voice of Farinelli' in Farinelli and the King alongside Sir Mark Rylance, after which he will return to Europe for additional opera productions, a solo recital at the Palace of Versailles, and a world-premiere concert with Daniel Barenboim. Mr. Jurenas had previously participated in NATS competitions as a baritone, but made his public debut as a counter-tenor at the Audrey Rooney Vocal Competition. Angela Carr, soprano, received her Doctor of Arts degree in Voice Performance from Ball State University in 2015. Now a resident of Nashville, she teaches voice at both Belmont University and Lipscomb University. She also regularly performs with Music City Baroque and in the annual BACHanalia concerts in Nashville. Ms. Carr is a member of NATS and volunteered during the Mid-South NATS Regional auditions at Belmont in 2017.